What is This Machine? Also need a reproducer. Post subject: What is This Machine? Also need a reproducer. Think this is a hodge-podge, but looking to get a reproducer for it or this one fixed. Post subject: Re: What is This Machine? Also need a reproducer. It's an HMV 33, and somebody has put a Columbia Viva-Tonal tonearm and reproducer on it. 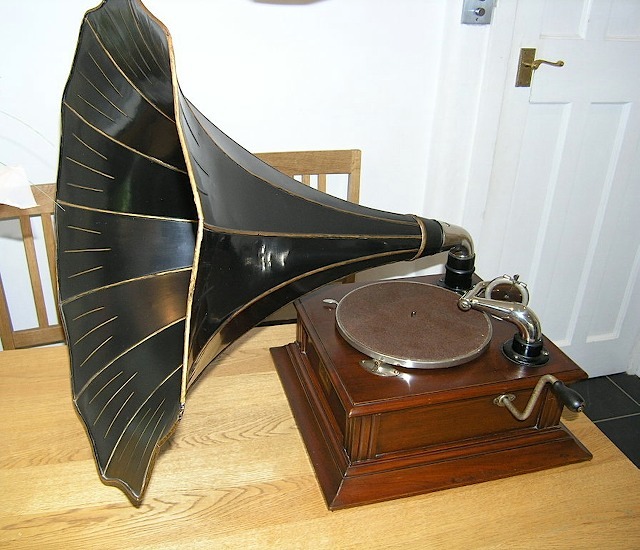 There were a few variants of this format (with different model numbers of course), the last of which had an orthophonic tonearm and reproducer on it - yup, an outside-horn orthophonic machine, from the factory. It should readily accept your typical pre-ortho Victor/HMV tonearm and Victrola #2 reproducer, but if the existing one sounds ok, why not keep it on there for a while. The motor looks correct. I think these were late-era units intended mainly for export, and to use up old parts. Mine came back from India, and has a dealer tag from Calcutta IIRC. I'm not sure what that is. If memory serves the "Dog and Baby" sound box is a Japanese Columbia knockoff. A Frankenphone I think... ,maybe a colonial model? EDIT: I see Peter beat me to it. The reproducer is missing a lot. What should I replace it with and where can I get it? I do have a HMV #2 would that be appropriate with the current tone arm? This is not for me but someone looking for advise form me, so I want to be right. I'd say replacing the tonearm with a Victor or HMV one will be super easy - and that allows you to make it authentic again since you already have the proper (HMV #2) reproducer for it. See the link I added earlier for pix of an authentic machine to see what sort of tonearm to find (although I'm not sure the horn on that one is correct). Last edited by gramophone-georg on Fri Feb 23, 2018 2:42 pm, edited 1 time in total. I could be wrong, but in eyeballing the pic it seems that a reproducer on that arm might put the needle point a bit long of the spindle. You could test fit the "Dog and Baby" to see. If it passes muster I'd think a Columbia Viva Tonal will work fine on that arm as it looks like a Columbia Plano Flex. Try eBay UK for a correct arm. It looks like the motor was swapped. It should use a late Victrola 2 spring motor. These motors are common. The motor shown in your pictures looks like it is used for a Victor III or a IV. Also, used for the early table top VV XI or the first floor model. The motor alone is worth it's weight in gold. The brake should be a tab break, like you see on a Victrola. The hard part would be to find the right bracket, arm, and an HMV reproducer. This will be a neat machine once you get it restored. I don't think finding a replacement tonearm will be easy: this machine utilises a very short arm, that was only used on the HMV nursery model besides this 33 and the model 29. All three are quite scarce machines. I have both the 33 and the 29. You can fit a portable HMV101 tonearm on the 33, but it is too long and the needle will extend far beyond its ideal location over the spindle, which is not good for the reproduction not for the records. I don't know if Victor ever manufactured such short arm, but usually Victor and HMV hardware are not easily exchangeable, they look similar but when you try to fit them you notice that the dimensions are not the same (from personal experience ...).